Mid-19th century seed pearl brooch, with elaborate knot motif by Tiffany & Co.
Organics are cropping up everywhere‚Äîin your local big box supermarket, at the neighbourhood farmer’s market, on the menu of your favourite bistro. For centuries, luxury organics‚Äînamely pearls‚Äîhave been popular personal adornments for the fingers, necks, ears, and wrists of the powerful and the wealthy. It’s a fascination that continues today. Renowned museums, such as the Victoria and Albert Museum in London, New York’s Metropolitan Museum of Art, and Toronto’s Royal Ontario Museum, hold lavish exhibitions and informative lectures on these magnificent treasures with a view to their historical significance, provenance, and dollar values, too. Pearls are a cosmopolitan commodity having origins in the waters of the Middle East, South and East Asia, the Philippine islands, South America, Mexico, off the western coast of Australia, and in the river deltas of Mississippi. Commercial pearl diving has been an international endeavour. There’s a theory the Romans invaded Britain lured by freshwater pearls from Scotland’s mussels. 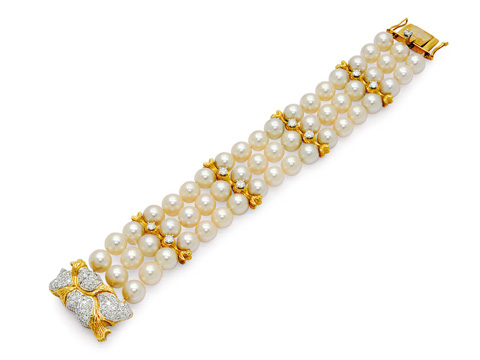 Multi-strand cultured pearl, diamond, and 18-karat gold bracelet. Much lusted-after for millennia, this beloved organic material needed no cutting, faceting, or polishing; apart from possibly a drill hole depending on application, a pearl emerges fully grown from the shell and ready to use, limited only by a designer’s imagination. Since only one oyster out of every 2000 might have contained a pearl, it was this uncommonness and rarity that contributed to the higher values and the lust of desirability. There’s a widely held popular misconception about how natural pearls are created. The common belief is that it’s a grain of sand or bit of grit that annoys the heck out of the oyster and in self-defence, it begins the time-consuming effort that eventually creates a pearl. Most often, it’s larvae or tapeworms that lodge in the mantle tissue. This magical virtue of adaptation is an intriguing way to turn a negative situation into a positive and elegantly solves a problem, plus the end result is something tangible and pleasing to the eye. Bivalves, such as mussels, have the capability of producing a pearl, but theoretically, any calcium shell-based mollusc can and sometimes does with the best quality natural specimens originating in oysters. Double-strand natural pearl necklace with 129 pearls and old-cut diamond clasp in platinum and 18-karat white gold, circa 1930. Aragonite is a type of calcium carbonate mineral in crystalline form and is generally white in colour. It forms the basis of conchiolin in the nacre, determining the eventual colour of the pearl. Creamy, silvery, or pinkish overtones are dependent on regional characteristics and oyster variety, while the level of lustre is determined by the nacre’s thickness and quality. Price is significantly affected by variables in shape, size, sheen, iridescence, pitting, and blemishes from imperfections. The more perfect spheres are the rarest and most prized. Especially from the 1400s onward, traditional court artists painted portraits of kings, queens, dukes, duchesses, and yes, royal mistresses, too, each depicted on canvas wearing extravagant finery encrusted with pearl embroidery, draped in multiple long strands of matched round or slightly off-round pearls. Their crowns, tiaras, headdresses, and ears, or in the case of the men, singular ear, dripped with huge drop-shape pearls. And all of these were natural, since it would be a few hundred years before Mr. Mikimoto, who gets the credit or the blame for creating cultured pearls, depending on your point of view. Occasionally, some of the natural beauties show up at auction, as do breathtaking pre-1920’s designs from renowned houses like Vever, Lalique, Chaumet, Tiffany & Co., and Cartier. 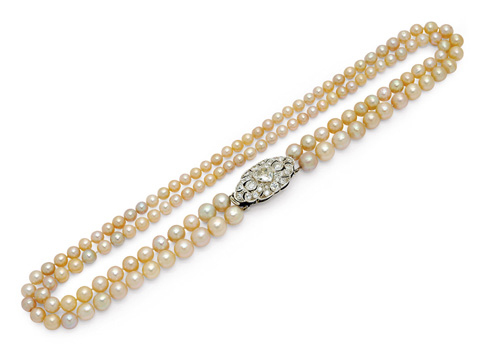 Currently, natural pearl necklaces can sell for upward of $200,000. Many natural pearl jewels that come to market had changed hands around the time of the Russian Revolution, as aristocrats escaped the violence and turmoil. Off-shape, misshapen baroque pearls were popular royal jewels during the Renaissance, as evidenced by portraiture of the period. 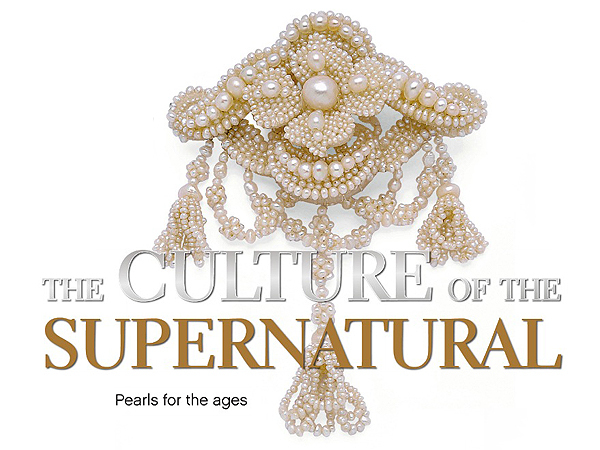 Baroque pearls were back in vogue in the 19th century in Renaissance Revival figural brooches. 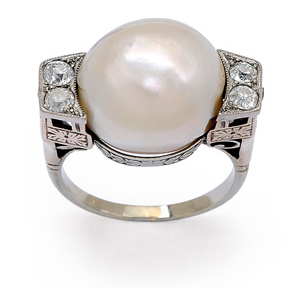 Natural pearl and old-cut diamond ring set in platinum-topped 18-karat white gold, circa 1940s. Imaginative and fanciful examples of these pearls were used to create animals, mermaids, mermen, and butterflies. Some of the most famous examples, known as the Canning Jewels, were once owned by Britain’s Lord Canning and are on permanent display at the Victoria and Albert Museum. Semi-baroque and flattened on the bottom bouton types were attractive in some applications, as were tiny split pearls. In the late 1700s and throughout the 1800s, small seed pearls commonly came from India and China, comprising elaborate love-knot designs strung on silk or pale-coloured horsehair affixed onto backings of mother-of-pearl. Imagine the time, patience, and dexterity required to drill them using hand tools. Elizabeth I of England and every other royal house in Europe and Asia had a predilection for pearl adornment. Other Elizabeths that love wearing pearls include Elizabeth Taylor and our present Queen. Taylor was widely photographed wearing the magnificent ‘La Peregrina’ drop pendant, circa 1500s, and she also owned an enviable pair of large pearl ear pendants by Bulgari. Just last year, Gina Lollobrigida auctioned a pair of ear pendants for a charity and realized over $2 million, breaking all former records. The Queen owns a sumptuous collection of inherited and gifted pearls and is frequently seen with a matronly multi-strand necklace. Queen Victoria, too, was an avid lover and commissioned from Garrard an appropriate set in black to wear during her period of mourning. Contrast this view with the voluptuous Marilyn Monroe, who in 1954 was gifted a Mikimoto cultured pearl necklace by her then-husband, Joe DiMaggio. It was a short 16-in. piece and theirs was a coincidentally short marriage. The story of cultured pearls began in 1893 when Mikimoto’s experiments produced a misshapen pearl from an Akoya oyster. The world’s jewellers and buying public had to wait until 1905 for an acceptably spherical form. So, the world is your oyster and with any luck, there may be pearls in your future. Enjoy the visual beauty and vital bounty of the pearl-bearing bivalve, but just in case, make sure you have your favourite jewellery designer on speed dial.